Blue Apron is a meal delivery service that provides fresh, pre-portioned ingredients and easy-to-follow recipes to its customers. It pays close attention to the selection of meat, produce, and condiments that are delivered to the homes of its customers each week. Blue Apron is definitely one of the best meal delivery services on the market. 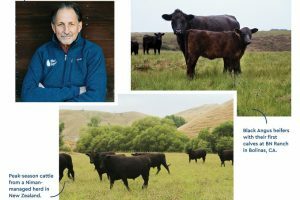 In order to take its service to the next level, Blue Apron has recently purchased BN Ranch founded by sustainably sourced meat industry pioneer Bill Niman. BN Ranch is located in Bolinas, about 15 miles from San Francisco. Bolinas is located in Marin County, which is known for its mild climate and breathtaking meadows. The pastures in Marin County are green all year round, which makes them perfect for raising grass-fed livestock. BN Ranch was founded in 2007 and has been run by Bill Niman and his family since. Bill Niman has been working on his own ranches since the 1970s in an attempt to promote humane practices in livestock raising. Blue Apron, which has worked with Bill Niman for years, has recently made the decision to step up its game, taking full responsibility for maintaining a high standard of livestock raising. This is the first time Blue Apron has purchased a farm from one of its suppliers and it promises to continue providing world-class meat to its customers. As an additional guarantee of high-standard livestock raising, Blue Apron has decided to offer Bill Niman a position in its management team. Blue Apron co-founder and chief operating officer Matt Wadiak has welcomed Mr. Niman to Blue Apron’s team, saying that Bill Niman and Blue Apron share a vision of providing responsibly raised meats to all passionate cooks all over the country. Although he’s become a member of Blue Apron’s management team, Bill Niman is still the president of BN Ranch. In the future, he will use all his knowledge and experience to help Blue Apron raise the standards of animal welfare, so Blue Apron subscribers can rest assured that every piece of meat they receive is sustainably sourced and responsibly raised. According to the announcement, Blue Apron is also going to include Mr. Niman in the development of new programs for grass-fed calves in order to improve beef husbandry. Moreover, Mr. Niman is also expected to help with spreading the network of Blue Apron’s suppliers, ranchers, and farmers.